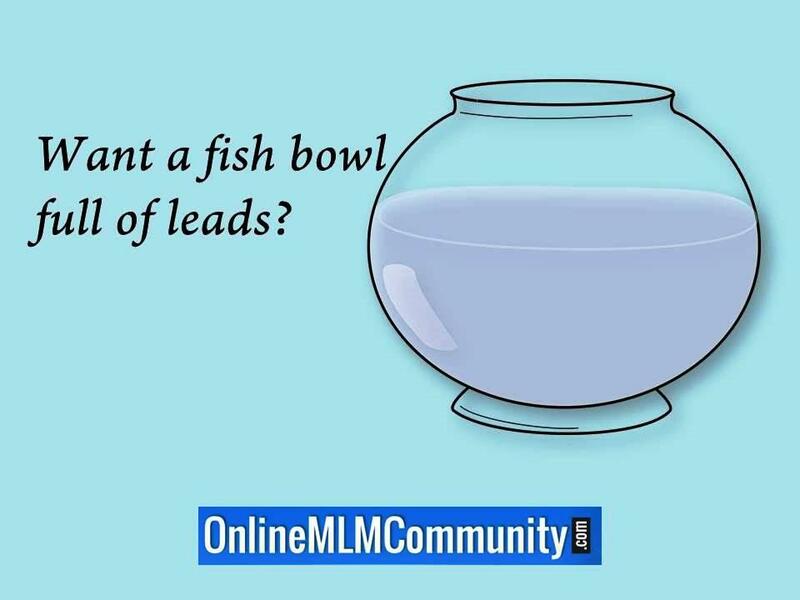 The fish bowl lead generation method is an easy way to get more leads for ANY type of business, especially for network marketers. Here’s how it works. You visit a local business owner, preferably a mom and pop type of business, such as a liquor store, coffee shop, dry cleaner or gas station. You talk with the business owner and let them know that you would like to do a raffle for a free product, and that you will also give them a free product for letting you do the raffle at their business. Or, you could offer to pay them for letting you do the raffle. You need to have a raffle prize selected before you visit the business owner, so you can show them what it is. Normally, a free product will work fine. For instance, if you sell skin care products, maybe you do a raffle for a free skin care set. I’ve found that an item in the $40 to $80 price range works great. Once you agree to the terms with the business owner, you would leave an empty fish bowl in a prime location in their business, normally near the cash register. For the next 5-7 days anyone who visited that business could enter their business card into the fish bowl, to be entered into a raffle. After the five to seven days are up, you would go back to the business and collect the fish bowl. You would select a winner and deliver or mail their prize to them. You would also make sure the business owner knows you did this step. Next, you would contact everyone else who put their information into the fish bowl and let them know that they did not win the grand prize, but you are offering them a free coupon for 50% off any purchase they make from you in the next 30-days (or something similar). Of course, not everyone you follow-up with will be interested in what you are offering them, but some of them will. Anyone who expresses and interest could be emailed the information and added to your CRM program or contact manager for future follow-up. One good strategy to use with the fish bowl lead generation method is to find 1-2 local businesses to do this with every single week. If you did that you could easily generate a few hundreds leads each week, at a very inexpensive price, and then you would have plenty of people you could share your products or business opportunity with. Even better, teach several of your team members how to do the same thing in their local area, and they too, will have a bunch of leads for their business. The bottom line is that the fish bowl lead generation method is a great way to get more leads for any type of business. If you follow the advice in this article you will be well on your way. Just make sure you get the business owner’s permission first! On a side note, what are your thoughts about the fish bowl lead generation method? Leave a comment below to let me know what you think. I look forward to hearing from you. Have a great day! I really like this idea. It’s a great way to generate and follow up with leads that won’t feel spammy but will surely get a few sales. I imagine it’s most effective with businesses in your company’s niche with a lot of foot traffic (for example, organic health stores if you have organic health and wellness products). Absolutely. You can test out different stores and locations to see what does the best. You never really know which location will be the best until you test it. Thanks for the comment.